"In difficult times always carry something beautiful inside." Welcome. I am the author of the book Seasons of Solace. Before I knew that I would have a book published, I began this website in an attempt to explore the healing journey through grief. I believe that healing comes as we make space in our lives to acknowledge and express our pain. Several years ago my rosy view of life was shattered when my husband was killed by a drunk driver. I soon found that this one loss set in motion all kinds of other “lesser” losses, which I also had to learn to live with. As much as we don't want it, loss affects all our lives at various points and in various ways. If you are feeling the need to talk to someone about your pain, read my Online Grief Counseling article. 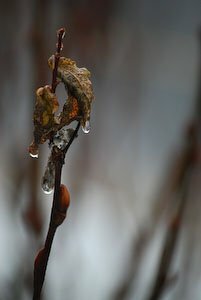 I offer this website to all who are on a healing journey through loss. Your loss may be traumatic and life-altering. Or you might feel your loss is small compared to some, yet your feelings are real and need to be honored. On my journey, finding emotional healing has come through learning, writing, photography, and finding other creative ways to express my feelings. You may not see yourself as very creative - I didn't see myself that way either. But this isn't about becoming an accomplished artist, it is about becoming whole. I invite you to explore some of what I have learned and how creative self-expression helped me to find healing. During my grief journey, I enrolled in a graduate program with a concentration in Trauma Healing. I also trained and became a spiritual director. These studies helped me process my pain and find new hope. Learn about Seasons of Solace from author Janelle Shantz Hertzler's website. Do you feel alone in your grief? Listen to the story of someone who understands. Seasons of Solace poetry readings for church groups, book clubs and support groups. A regular newsletter from the Journey-Through-Grief.com website. It includes journaling exercises, reflective writings for grief and loss, and updates about the site. This grief blog keeps you updated on all additions and changes to Journey-through-Grief.com. Subscribe here. Considering online grief counseling? Read these interviews. The author began to make memory books to help work through her grief. She shares ideas for both memory books and scrapbook journals. Personal memorial gardens can provide a peaceful and healing place to remember your loved one. Grief journaling is an important healing tool, but can feel overwhelming. These tips and ideas make journaling manageable. Photography can be one of the best and easiest means of dealing with grief emotions. The author shares ides for using it for healing in contemplative photography and memory books. Writing and reading grief poems can be a helpful way to work through the pain and sorrow of loosing a loved one. Author of grief poetry shares her experiences. The scriptural psalms of lament became very helpful to this author during her grief journey. She shares her learning and how to use the laments for your own reflection. A free memorial website to post tributes to deceased loved ones. Virtual memorials or online memorials are a convenient way to help scattered family members share memories. This page is dedicated to reader's bereavement stories. Read what others have learned and contribute your own story. Prayer can be difficult in times of loss or pain, find helpful inspirational prayers, sample prayers, and prayer requests. Learn about the stages of grief, how the order of the 5 stages of grief can be differnt for different people, and how the grief stages affect your handling grief. CJ Couvillion writes openly and honestly about his experience with the loss of a child, his son Stephen Couvillion. This page lists some of the top bereavement books and grief recovery books recommended by an author of a grief book and website. Grief book and website author offers her own unique tips and articles on grief. After the author's husband was killed by a drunk driver, she took a Trauma Awareness and Healing class. She writes about her learnings and reflects on it for the healing journey. These bereavement interviews share the grief stories of people who have experienced a varity of losses in life. This retreat called visualizing your spiritual journey uses photography and other visual arts to express your spiritual journey. Find the right words to express sympathy and words of comfort for sympathy. Hospice chaplain provides inspirational devotions for life's difficulties. She also provides lectionary commentary. 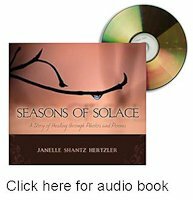 Janelle Shantz Hertzler author of Seasons of Solace and the Journey-through-Grief website tells her "about me" story of loss and healing. You can contact me with any suggestions or questions about things you would like to see on the site. Links for webmasters and bloggers to use to share this grief site with their readers. Before you buy, take a minute to read this My Memories Suite review and enjoy a coupon.